Fredrikstad Fotballklubb is a football club from the city of Fredrikstad in Norway’s Østfold county, located around sixty miles south of Oslo. FFK was formed on April 7th 1903, concentrating solely on football, unlike other clubs of the day. Fredrikstad initially struggled for opposition, until an Englishman, HW Kenworthy started a club in nearby Sarpsborg, who played against FFK in their first ever match, with both clubs setting up regional series football. In 1914 the club moved into the original Fredrikstad Stadion on the east bank of the River Glomma. 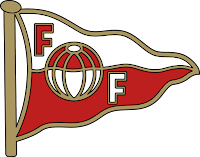 After changing playing colours several times, FFK settled on red and white for the first time in 1927. In 1932 the team reached their first Norgesmesterskapet i fotball for herrer; Norwegian Cup Final, which was won 6-1 against FK Ørn at the Marienlyst Stadion in Drammen. A 4-0 victory in the final of 1935 followed against Sarpsborg FK at Sarpsborg Stadion. The Cup was retained in 1936 as Mjøndalen IF were defeated 2-0 at Oslo’s Ullevaal Stadion. FFK won the first ever national League of Norway in 1937-38 after victory over SFK Lyn in the Championship Final. The team went on to complete the double with a Cup final win against Mjøndalen IF after extra time at Briskeby Gressbane in Hamar. The league title was retained in 1938-39 following a Championship Final win against Skeid. Fredrikstad won the final Cup competition before a break for the War in 1940 as Skeid were defeated 3-0 with Arne Ileby scoring twice and Knut Brynildsen netting the other goal. As peace was restored FFK reached three Cup finals in four years, but lost out twice to Lyn, and then Sarpsborg FK. The league title was collected for a third time in 1948-49 after an aggregate victory over Vålerenga. 1950 saw a sixth Cup triumph, with SK Brann the runners-up at Ullevall Stadion. The following decade would see a golden period in the clubs’ history. Odds BK were beaten in the Championship Final of 1950-51 as Fredrikstad were crowned Norwegian champions once again. A win over SK Brann twelve months later meant the team retaining the title. FFK saw off the challenge of Skeid in 1953-54 to lift their sixth national championship, but the same opponents gained revenge in the Cup final the same season. Fredrikstad finished as league runners-up to Larvik Turn in both 1954-55 and 1955-56. However, FFK were not to be denied in 1956-57 as Odds BK were overcome on aggregate to win the title once again. A 4-0 Cup final win against Sandefjord BK completed the double thanks to a brace from Kristoffersen with Johannessen and Bjørn Borgen adding the other goals. Further league championship wins were completed in 1959-60 and 1960-61 with Lillestrøm SK and then Eik-Tønsberg the beaten finalists. The second of the triumphs was married up with a 7-0 Cup final victory over SK Haugar, as Kristoffersen and Olsen both scored twice, with additional goals added by Borgen, Arne Pedersen and Kristiansen. The league title saw Fredrikstad’s qualify for the European Cup in the 1960-61 campaign. Ajax were defeated 4-3 on aggregate in the Preliminary round before bowing out to Danish club AGF, as the club and town prospered through its shipbuilding industry. Three second place league finishes ensued throughout the rest of the 60’s, while the 1966 Cup competition was won 3-2 against Lyn with two goals from Borgen and another from Pedersen. Strømsgodset IF defeated FFK after a replay in the 1969 final. The club competed in the Cup Winners Cup of 1967-68; going out to Vitória de Setúbal in the first round. The team also reached the final of the 1971 Cup, losing out to Rosenborg BK, while they finished as league runners-up in 1972. FFK went out to Dynamo Kyiv in the first round of the 1973-74 UEFA Cup, as a second tier club after being relegated the previous season. FFK continued to train just twice a week while competitors became more professional. Promotion was won at the first attempt, but the team went back down in 1976. FFK returned to 1. Divisjon for the 1980 season. The team was relegated via the play offs in 1982 but bounced back just twelve months later. The 1984 season saw Fredrikstad relegated once more, despite lifting the Cup for a tenth time after a 3-2 replay win against Viking FK thanks to goals from Jørn Andersen, Per Egil Ahlsen and Terje Jensen. Worse was to follow in 1992 as FFK were demoted to the third level of Norwegian football. The club would languish at that level for the following decade. It would take the appointment of head coach Knut Torbjørn Eggen in 2001 to change fortunes. In 2002 the team won promotion from 2. Divisjon before finishing as runners-up in 1. Divisjon the following season to return to the top tier Tippeligaen, aided by the goals of Markus Ringberg, where FFK consolidated their position. Egil Olsen was head coach for the 2015 campaign before Eggen returned to lead the team to the Cup with a 3-0 win against Sandefjord Fotball as two goals from Raio Piiroja added to Hans Erik Ramberg’s strike. Hammarby IF ended any European prospects in the UEFA Cup as Anders Grönhagen took over coaching duties, while Tarik Elyounoussi and then Garðar Jóhannsson scored the goals as the club crossed the river to the old shipbuilding area into the new Fredrikstad Stadion. The move worked as crowds flocked to the new stadium and the team finished as league runners-up. The team lost to Lech Poznań in the first round of the Europa League as Tom Nordlie took charge of the team, who were relegated in the play-offs to Sarpsborg 08. Tom Freddy Aune led the team to promotion in 2010 as the goals of Celso Borges helped the team win the play-off against Hønefoss BK. Trond Amundsen was in charge of Fredrikstad as they were relegated to the second level 1. Divisjon in 2012. Lars Bakkerud arrived as the new head coach before Håkon Wibe-Lund took over as the team finished mid table in 2013 with Robert Stene topping the scoring charts. Fredrikstad failed to win promotion through the play-offs in 2014. The 2015 season was a disappointment. Wibe-Lund was replaced by Arne Erlandsen with the team finishing one place above the relegation places despite the goals of Henrik Kjelsrud Johansen. Jan Halvor Halvorsen was appointed as the new team boss at the end of the season. Mons Ivar Mjelde led the team in 2016, who once again just finished above the drop zone. A reign from coach Andrea Loberto was ended as Bjørn Petter Ingebretsen was given the task of keeping the team up. Fredrikstad were defeated 5-3 on aggregate by Notodden FK in the play-offs to drop down to 2. Divisjon as Per-Mathias Høgmo was brought in as head coach in an attempt to halt the slide. Fredrikstad FK will play in 2. Divisjon in the 2018 season. Please click here to read about my visit to fourth tier football at Fredrikstad Stadion.